In the last issue of the “Hot Sheet” I talked about the importance of partners in police work and how we at the historical society also have some very important partners. This month I want to recognize and give a little background on the history of the Los Angeles Police Protective League (Los Angeles Police Officers have always just called it “The League”). 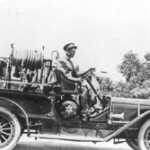 In 1922 the Los Angeles Police and Fire Departments banded together under one group to establish a retirement system for the City’s police officers and firefighters and a year later the Police and Fire Protective League was established to protect the newly established retirement system. During the 1920’s and 1930’s, the League obtained medical benefits for the City’s police officers and firefighters and established job protection clauses in the City’s Charter. As the number of police officers and firefighters grew to serve the increasing population of the City of Los Angeles from the 1940’s to the 1970’s, the League gained numerous pay raises and benefits for them. Three of the additions were: longevity pay, time-and-one half overtime pay and hazard pay for motorcycle officers. In 1973, the Police and Fire League separated into two organizations. The Los Angeles Police Protective League (The League) was established as the recognized bargaining organization to represent Los Angeles Police Officers from the rank of police officer to lieutenant. The United Firefighters of Los Angeles City was established as the bargaining organization for firefighters. A board of directors was created to manage the operations of the League (classified as a California non-profit corporation), while nine elected directors manage a multi-million dollar operating budget that funds collective bargaining efforts, educational scholarships, legal support, government advocacy, and numerous other activities that benefit the League members. The League maintains in-house attorneys and legal staff who deal with unfair labor practices, grievances, arbitrations, and myriad other legal issues. The League was a leader in sponsoring state legislation to ensure that police officers’ rights were protected when being investigated internally. Governor Jerry Brown signed the Public Safety Officers procedural Bill of Rights Act, which continues to protect police officers’ rights today. 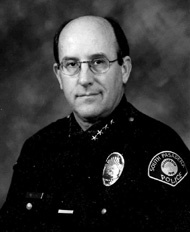 While the legal and labor issues facing Los Angeles Police Officers daily are extremely complex, the League who stands behind them states their mission very simply: “Protecting Those Who Protect Others” Ted Hunt, a dedicated and long serving League director currently represents the League on the Board of Directors of the Los Angeles Police Museum. The Los Angeles Police Museum is very proud of their relationship with the League and deeply appreciates their ongoing support. Although there are those in the City of Angels who claim to read minds, we know this as science-fiction. Not one of us can truly determine the thoughts of another. It is however, sometimes clear what is on people’s minds. When the office phone rings, it may not be a single phone call that reveals a collective of thoughts, but when there are numerous inquiries, it eventually becomes clear what folks are thinking about. Without giving it much thought, I fielded several calls from media outlets regarding the fortieth anniversary of a significant event in the City’s history. Not the City’s finest hour, but part of history nonetheless. In the heat of August, 1965, riots broke out in South Bureau. During a roadside investigation, a California Highway Patrol Officer was forced to overcome a DUI suspect’s resistance. The mother and brother entered the fray. Within moments a crowd formed and additional officers were needed to control the situation. As the night grew, so, too did the crowd and the police response. Rocks, bricks and bottles were thrown at officers. Nineteen officers were injured the first night. From a small group of twenty or so, the crowd grew to 1,500 then to 7,000. As more became involved, the violence expanded from pockets to wholesale assault and destruction. This was the 1965 Watts’ riots. The National Guard was activated and the Los Angeles Sheriff’s Department rendered mutual aid to the City. Arson, shootings and looting ravaged South Los Angeles. In the aftermath, large areas were without electric and telephone service. Homes and businesses were destroyed and 31 lives were lost. The final tallies were staggering; more than 3,000 arrests were made, more than 2,200 for felonies. The court system was realigned to handle the mass of preliminary hearings. Nearly 14,000 troops were deployed along with the various police agencies. Property damage topped 200 million dollars. At the time, Watts was patrolled by the officers of 77th Street. More than a decade later, an 18th police station, Southeast, was opened. With the addition of the station, The Watts neighborhood became part of Southeast Area. Today, references to Watts Police translate to Southeast Area. Even though they accepted this job in 1978, people should know, Southeast officers weren’t the first Watts police force, and Watts wasn’t always a developed urban area replete with freeways, and highdensity housing projects. The police force didn’t always drive high performance sedans, nor was their work assigned via radio or MDT. Some years ago the historical society received these photographs from a retired member of the Department, Mike Cleary. Depicted at the far left is the father of one of Cleary’s distant cousins, Otis Hill. 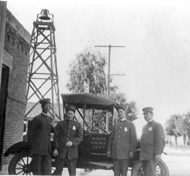 The others, as the car door says, are members of the Watts Police Department, circa 1917. The two-seater patrol car has given way to the Crown Victoria, and the alarm bell’s function has been supplanted by the repeater tower in the Southeast station parking lot. When examining the officers in uniform, another sign of the times is evident. No one is wearing a Sam Browne. In the photograph on the left, Hill is aboard a fire truck, again showing the Watts of a different era. The landmark Watts’ towers were yet to be constructed, limiting residents’ architectural appreciation to the Watts’ windmill and water tank! LAPD. And while Dan was then a retired member of the LAPD, he remained active on the historical society board. Earlier this year Chief Watson requested to join the ranks of the board of governors. This change has allowed Dan to devote more time to the South Pasadena Rotary Club and the Desert Refuge Police Officers Association, organizations with which he is actively involved as a board member. In reflecting on the differences between the LAPD and his current department, Dan has noticed that he is far more involved in the day-to-day business of the department. Besides determining his department’s priorities, policies and direction, Dan also responds to high priority incidents and backs his officers on traffic stops and arrests. “I have done more police work in three years in South Pasadena than I did in my last 15 years with LAPD,” Dan said. Working with a smaller agency means there are fewer officers, so the chief helps out where he can. Because South Pasadena is a closeknit community, Dan has found one of the most effective ways to stay in touch is to handle matters personally. Each of his e-mails, letters and telephone calls merits personal attention. While most chiefs would delegate these tasks, this is one who is committed to his community and eager to follow-up personally. Despite the significant commitment to South Pasadena, Chief Watson finds time to promote the profession of law enforcement well beyond his city’s borders. In the past five years, he has been to Hungary, Bulgaria, Moldova, South Africa and the Philippines to teach law enforcement to nations in transition. This undoubtedly is a labor of love that Chief Watson plans to pursue upon his retirement from active law enforcement. Although this day is still years away, the historical society looks forward to it with great anticipation. It is our hope he will be back with us, actively serving as a director. Until then we will know South Pasadena is in his capable hands.